Last week’s Royal Society symposium – on whether the Evolutionary Synthesis should be extended, or whether (as some appeared to imply) all the dramatic new mechanisms found recently were successfully and silently subsumed into standard population genetics several centuries ago -had a slide that caught my attention. It caught the attention of ID people in the audience as well, which is how I came to be aware of it. It was in Andy Gardner’s talk expounding the virtues of “weak adaptationism”. To me it illustrates neatly how blind naturalistic science still is to its metaphysical assumptions. I want to concentrate on that after a couple of observations on the talk itself, which is outlined here . His ideas, to anyone with only a nodding acquaintance with basic Darwinian theory, appear uncontroversial: there are lots of mechanisms involved in evolution, but the thing that produces all the interesting stuff is still Darwinian natural selection, even when that concept is stretched to include kin, and communities, and apparently any level of organisation in the living world that can be said to “work”. And yet he claims an awful lot for natural selection, given claims from elsewehere (even at BioLogos) that Neodarwinian adaptationism is, and has for decades been, completely dead in the water. Neutral evolution is what matters, whose main connection with NS is overwhelmingly through purifying, not adaptive, selection, and which is said by Austin Hughes to produce adaptation without selection via the “plasticity-relaxation-mutation” process. Clearly Gardner doesn’t understand evolution, or them others don’t, or – and of course, this is the default position – we observers don’t, and actually everything else fits into sweet agreement for those with eyes to see. I confess I’ve squinted like anything, but I still see opposing schools of thought each claiming to be the consensus, or more usually to have been the consensus for ever and a day – evolution’s ruling opinions, like its outcomes, always seem to have their origins hidden in deep time. Even so, there are things that I venture to suggest Gardner hasn’t understood adequately, one being Intelligent Design, and more broadly theism; and another the art of clear thinking. Now, we should long since have come to expect that mainstream scientists will nearly always confuse “design” with “process”, and then accuse Intelligent Design of confusing “design” with “miraculous creation”. And everybody knows those Christians worship a donkey in their orgies, too… Since, actually, ID does not see design as process, but as teleology behind process, it’s clear that what Gardner is really asserting (as I will explain below) is that natural selection actually replaces God as designer, rather than merely as maker. But we ought to be very clear that, in opposing “natural selection” to “God did it” in this way, he has not only dismissed Intelligent Design, and Creationism – which some might prematurely applaud – but also Evolutionary Creation in all but its most deistic form. For if God did not “do” design, then he did not “create through evolution” in any real sense but, at most, stood aside and watched as the “free process” of selection got on fine without him. And so the slide actually makes an entirely unscientific metaphysical claim that there is no Creator God, because “natural selection” did it instead. Somehow, you’d expect more science and less metaphysics (and less unwarranted mudslinging at those not invited to speak) at the Royal Society. But the second line of the table also strays out of science into metaphysics, this time by using the heading “Purpose” to make natural selection a teleological force. Has he (and most of his hearers) forgotten that since Bacon final causation has been excluded from science, simply because of that “?? ?” under Intelligent Design? Bacon said that since we can’t presume to know why God would want to do particular things in nature, we must restrict science to efficient causes. And that means that natural selection must not be said to have the “purpose” of maximizing fitness, without explaining not only how it formed that purpose and foresaw its goals, but how we know any more about it than we do about God’s purposes. In truth, it would make pretty good sense to say that in any common view of God he “did” evolution the way he did in order to “maximize fitness”. That would be at least as accurate as to attribute such a purpose to natural selection, only without the metaphysical error of attributing purpose to a type of event. The usefulness of weak adaptationism is that it permits biologists to describe organisms and their traits in purposeful, functional, intentional terms. Such language is not necessary, but it is extremely useful. Not only does it provide biologists with a powerful shorthand—which can be translated with fidelity into the mathematics of gene-frequency change—but it also defines whole (and successful) programmes of research. For example, on the evolution of altruism. Then the Q&A arrived. Professor Tim Ingold of the University of Aberdeen, sitting to my left, was visibly agitated. Are you saying, he asked Gardner, that organisms are actually designed objects? Yes, replied Gardner. Well then, continued Ingold, if organisms are actually designed, then that would require a designer. Can you please say, he asked vehemently, how your explanation is any different from Paley’s? It isn’t, actually, any different from Paley’s argument, which Gardner had criticized. Ingold has studied some logic, it seems. So it wasn’t, in fact, intended as a metaphor at all: this presentation confirmed all the old suspicions that biologists repeatedly get away with claiming, within scientific contexts, that natural selection is a teleological force that replaces the need for God. The paper claims, in effect, that natural selection, because it always maximizes adaptation (even though mostly, in reality, it maintains stasis), can be described as having that as its purpose. It’s like saying, I suppose, that heavy things have an inner “want” to seek the centre of the earth – but Aristotle was drummed out of modern science for speaking like that. Joshua Swamidass would correctly say that Gardner, by claiming NS as a true designer, was not doing science, but philosophical speculation based on science. Just as was Eva Jablonka when, at the same conference, she commented, “Not God – we are excluding God.” A lot of dodgy metaphysics is going on in the name of science at the RS, wouldn’t you say? In case you think she had a good point in keeping God out of science, it is illegitimate to say that discovering any process excludes God, since it may be his process, which is what Evolutionary Creationists are entitled to claim from within science. Should TEs not get as annoyed by science’s bad metaphysics as they seem to be by ID’s bad science? But I leave the best till last. Gardner’s presentation summary makes great play on the consonance of his views on natural selection both with observation and the maths of population genetics. 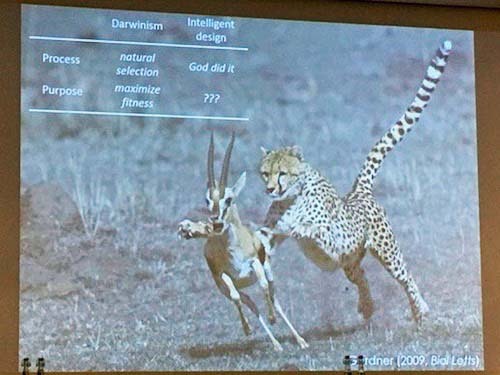 I just wonder, then, why he uses the cheetah-gazelle arms race in his slide, when on the cheetah’s side at least, the story is one of near-zero adaptation over at least the last 100,000 years, as I discussed here. Ah, I see – it’s yet another metaphor. I have done some interesting reading into this issue, and have discovered that the entire subject of teleology is completely misunderstood and confused by most non theistic biologists. I know this comes as a great shock to you, Jon, but what is surprising, perhaps is that the best clarification of this problem I have seen comes from no other than Daniel Dennett, atheist extraordinaire, who is also a world class philosopher, and as smart as they come. You are certainly right that the dismissal of God did it (how I hate that phrase) should be rejected by any person of faith, including ECs. I also think that what we are seeing here, and in many other instances are the bad consequences of the failure of modern science and scientists to fully recognize the importance of philosophical (which includes formal logic) thinking. Massimo Pigliucci is another atheist philosopher, like Dennet who has decried (vainly) this ignorant attitude. Quite agree Sy. I can’t remember the wise man or the exact quote to the effect that scientists like Richard Feynman were brilliant, but had lost the grasp of philosophy of a previous generation of physicists like Eddington, Pauli etc. But biologists, it seems, jettisoned such careful thinking way back – Darwin was noticeably weak in philosophy compared to some contemporaries including Gray, but at least he had some idea. Nowadays there seems a legacy of seeing science as the antidote to metaphysics, rather than realizing it is a product thereof. Gould was one exception (and as you say, Pigliucci another). But then one has the issue that philosophy itself has been dominated by secularism, with the notable exception of philosophy of religion, thanks to Alvin Plantinga. There’s less incentive to purge poor metaphysics from science when you’re a skeptic yourself. We need a few prominent TEs with a sound philosophical training to wave the flag … if they ever get a platform! Yup. But count me out; Too late for me to either get a sound training in philosophy or to get prominent. Maybe Joshua, he’s young enough, and seems very inclined to deep thinking, but then again he has that pesky problem of needing to do science so much of the time. Hmm. Who do we know who is highly trained in philosophy, Christian theology, is not ignorant of biology, has a platform and is rapidly gaining in prominence (even if his TE credentials are somewhat suspect in certain circles)? Dr. Garvey? Yeah, right – Bible in one hand, Ed Feser in the other and a copy of Michael Denton in the third (evolved specially for the purpose). What’s not to change the world?? Don’t really have anything to add, but chiming in to second Sy’s suggestion here! At least there is a recognition that uniquely in these matters things are not settled. unlike hard/heavy metal science. It also shows, to me, its all speculation. Evolutionism was always lines of reasoning from very little raw data. So how things evolve is easily replaced by other ways simply making reasonable options. Yet all was not seen and all options are not seen. However human beinghs looks sa in colours etc etc are seen. So biology change does happen. So how? In fact human colourization should be the first thing to explain by any mechanism and not the most silent. I’d say that the colour of human skin is one of the clearer stories of palaeo-genetics (just as it shows the monoclonal nature of the cheetah that makes a recent “arms-race” a just-so story). It seems pretty settled that light skin was a relatively recent change that arose in the far north of Europe c8000 years ago, and spread to the early farming types migrating from the middle east after that, because it had clear advantages in the colder regions. In other words, everyone had black skin until the shamanistic Lapps, or someone, got a couple of mutations. In YEC chronology, of course, that 8000 years might need to be shortened, but under that view (which as you know I don’t hold) it would show that Adam was black. That’s the science. Of course, as to why God would bring about that change (the “purpose” within the OP) that’s properly outside the bounds of science. The most obvious thing would be simply that it’s advantageous in the northern climate. What we can be sure of is that the explanation that it has something to do with a biblical curse on the Hamitic descendants of Noah is a complete abuse of the biblical text, which says no such thing and is a recent false misinterpretation to justify late European racism… not to put too fine a point on it (as I told a South African Bible College tutor a few years before apartheid collapsed). It’s a little amusing that, here in the UK, many of the Roman soldiers who ruled over my ancestors and, probably, brought Christianity to Britain, were from black African regions. Another interesting thing from your post is that it shows how the debate has changed sinced the nineteenth century. Now, as you say, it’s accepted on all sides that biological change happens, the questions in dispute being when and how. But the early opposition to evolution was based on “fixism”, ie that in the nature of things biological change couldn’t happen, because all possible species must exist now, somewhere or other.